Dad couldn’t stop smiling as he demonstrated the trap’s operation. The inner workings were so efficient that it barely made a noise, just a faint click and a soft flourish like an umbrella being opened. Dad had designed the trap to accommodate a raccoon the size of a sheepdog, but he still worried that it might maim the creature if it wasn’t calibrated just right. Eventually he went into the garage to take from the deep freeze one of the birthday cakes he’d purchased for bait, placing it on my skateboard and rolling it to the middle of the platform. If the cake survived the trap he said we could celebrate by having it for dessert that night. So writes Seth Fried as he takes us on a family’s strange and tender journey to capture a mischievous raccoon. 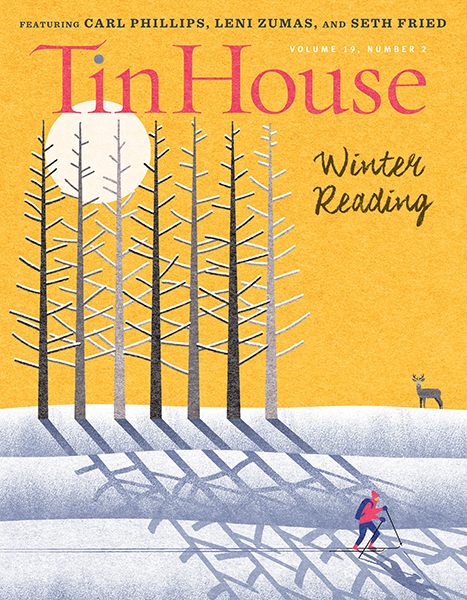 The most recent Winter Reading edition of Tin House magazine is out and for many it will provide welcome relief from all those big fat books calling us from our bucket lists. I find literary journals such as Tin House and Conjunctions both introduce me to new and often exciting authors, but they also provide a less demanding effort on my part, if only in that such journals generally contain shorter pieces and excerpts. This allows the little gray cells to rejuvenate while still being jiggled around a bit. I find this especially important in the winter months when I might not be able to run around in the sun to restore my batteries (actually, I don’t run around anywhere nowadays … my best exercise comes from a rousing coughing binge).